Rebelling against a life of black and white, Miranda Ryan paints the world in a technicolor fever. She spends her free time on park benches, analyzing people from the outside in and creating whimsical stories about their lives. Unbridled and full of life, her ever-changing heart is a revolving door no man can figure out. And she likes it that way. But when Derek Rhodes enters her life, he stubbornly challenges her every move. As she unsuccessfully avoids this opinionated prankster her colors fade to gray and she is forced into a choice . . . to lose the self she knows or the self she has never been. Derek Rhodes wears the same shade of brown every day and avoids eye contact with strangers, until Miranda walks into his life and splashes his world with streaks of colors he swore he’d never touch. Drawn to her imaginative personality, he finds himself questioning his own cynical nature and flat-lined ideals, only to fall in love and realize the only woman he’s ever let into his heart has no plans of letting a man into hers. Follow them both as they poke and prod and test each others limits on a journey of discovery. 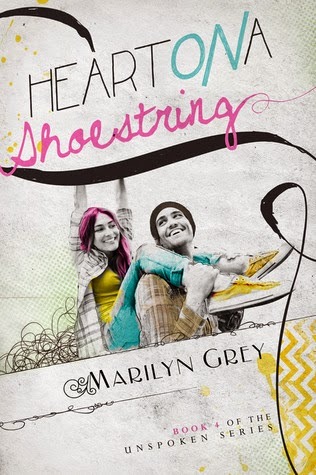 Heart on a Shoestring is the fourth book of the Unspoken series. It can be read as a stand-alone but best if the series is read in order. This book is Derek and Miranda’s story. It’s really interesting from page one ‘til the end. There’s the spirit of mystery lurking around that pushes me to turn the page until there’s no more. I love the theme of it, how the characters dealt with finding and accepting themselves first before diving in on the pool of relationship. I like Miranda a lot. She likes to sit on a park bench watching the people passing by and imagining what their story might be. She changes her hair color almost every week and dresses up in unusual clothes. But behind the cheery personality hides a sad past. Derek, on the other hand, is “the boring guy who always wears brown shirts”. He’s opinionated and almost always pisses off people when he stars spouting off his opinions. Almost. He’s sweet, though, even if he doesn't know it. He dresses up for Miranda because she doesn't like boring. That earned him a big brownie point. He’s also mysterious. I didn't figure him out until much later in the book, which I really liked. There’s nothing better than a good mystery for a page-turner. I love the way Derek helped Miranda “to be just herself”. He thinks she “doesn't want to face the person she is so she avoids her by being all these other people”. I love the snap decision he made to kidnap her. That trip is my favorite part. Sometimes, though, I really want to smack this man and dunk him on the nearest river before putting him on a freezer. He keeps doing these things to make Miranda face her true self and it’s very ironic because he himself if trying to run away from who he was. Granted, the past she’s trying to hide is dark and painful. The twist is amazing. Not for one moment did it come to mind. Totally unexpected. Grey’s twists keep me from wanting more and looking forward for the next books. Heart on a Shoestring is hands down amazing. This series, especially this book, is truly a must-read.